HI I AM, KAREN, THANKYOU FOR THE SAMPLE PRAYER, MAY THE LORD ALWAYS BLESSED YOU IN THESE SAMPLE PRAYERS, I FEEL MY HUSBAND IS ON HIS WAY, IN GODS WILL AMEN! Amen Amen this prayer conformation that. God hear my prayer. I just wanna thank you so much for this Simple prayer reminder for me. Because I’m in a relationship now. But I know I’m in Love with her. She a Christian. And a very humble woman of God. But I really believe that I can’t marry her. It’s not in the Root of my Heart. My name is ernesto. I only have feelings for her. And care for her. But that’s all. She knows I’m not in Love with her. But she’s hoping that Gods Spirit will anoint my heart to be in Love with her. Meanwhile I’m really waiting for God to reveal to me the Wife that I would fall in Love with. Please pray for me and Sweet anita. I want the best for her. Wow – this was an amazing prayer ?? I really did learn how to pray and use God’s word in prayer! Thank you for sharing! Genesis Chapter one; Lord God the way you created Earth, I pray that you will creat my marriage to the husband of my own. In Genesis you also created the first husband and the first wife, for I was once married but he wasn’t and isn’t good for me. You know my heart, my needs, and my wants. Will you please put him together just for me . Bless me for him and bless him for me in Jesus mighty name I pray…….Amen!!! Thank you Lord God.. Thank you!!! I sometimes feel like the Holy Spirit is speaking to me through u Jamie . I love all the prayers u send me and u repeat it daily even while I am driving . Thank u soo much . I am a divorcee and I am looking for a partner and praying too and that’s when I received your email about prayer to find a partner Jesus has kept for me and someone who loves Jesus . I keep waiting for your emails and I love every prayer and article u write . I have the desire for a husband. It’s been on my mind for awhile. Honestly I thought about it this morning. Not long after i had a talk with the Lord, I checked my email and saw this post. I am so blown away right now. For me it’s confirmation that the Lord heard me and will answer my prayer. Thank You for allowing the Lord to lead you to reach out to us. What a blessing coming across this prayer. I prayed it as I was reading it. I have full faith that my Father will bless and reconcile my marriage to my ex-husband. I claim it in Jesus Mighty Name. Thank you Jamie for the prayer. If only I could give you a BIG hug!!!! Thank you for this precise and power-filled prayer. Lord thank you for leading me to this post on marriage! I know you hear my desires! In Jesus name! Thank you Jamie for this amazing prayer and for everything else you impart into us. May God bless you 100 fold of everything you pour out! Hello Jamie. Thank you for the prayer, I’ve been with my future husband for almost 9 year now, and God wanted us to separate and also to stop having relation with one another, we both obeyed. It’s harder for him …and for me at times, but I will continue to trust God and His timing.. Thank you for this prayer Jaime!! Some of these things I didn’t have the words to ask God for but they were in my heart. Thank you for this prayer.. may God richely bless you..
Jamie, I don’t know how we got connected, I don’t even remember how I got to your site! This prayer answers my prayers for a mate because I did not know how to ask God for one! This prayer of yours that I was guided to let’s me know my new husband and I are getting closer to meeting! I ask God for you to be blessed abundantly for posting this! Heartfelt thanks to God for placing you where I was searching for help and to you for this prayer…thank you Jesus in advance! Heavenly Father thank you in advance for the husband that is meant for me! What a Divine Blessing it is to have found this website! I wish everyone who reads this receives the desire of their hearts! To God Almighty be all the glory ,forever and ever,Amen and Amen!!! Thank you for this wonderful prayers may God continue to bless you. I believe God will manifest soon in my life as finding the right partner in Jesus name Amen. Thank you Jamie for this. I believe my spouse is on her way. The prayer is really a good model. Thank you. This is beautiful , good sample prayers.God bless you. Thank you Jamie. I believe God has done it in Jesus’ Mighty name! Thank you very much for this prayer. It encouraged and strengthened me. I felt release when I read this prayer and I believe in the Lord and know that his blessings is on me. Thank you for this awesome prayer. God bless you. Dear, I loved your prayer and I have to admit that I am desperate to find a life mate I have been alone all my life and never figured out why it never worked with anyone i am so lonely and feel life is meaningless i need love that heels me and praises God, can i ask for your prayers because i just can’t pray properly recently and can’t connect with God, He may be talking to me but i am confused and lost. Thank you. I needed this. I needed my faith to be restored. I recently was lift in a 6 year relationship (yesterday) and I felt lost. I felt afraid that I would not find the man that was right for me, to stay with me. Reading this, reading this has helpped me feel better. that I will find that spouse sooner then I think. I hope god hears, and knows my true disire. God Bless you for this wonderful prayer. I’ve been waiting for a long time and I believe My mate is coming soon for me. Thanks again! I just love your pure prophetic ministry. It’s very refreshing and encouraging to my soul. I’m praying this every day. Please pray for me too, that God will bless me soon with the best man that He has for me. I’ve been praying for a husband for 12 years. I want God to choose because when I tried to choose myself before I made mistakes and was fooled. Please ask God to bring the man He has for me into my life, because I want to have children (in a few years I’ll be 40). Awesome. I will certainly use the sample prayer. Couldn’t have come at a better time. We thank God for using you to direct others how to pray using Gods promises. Timely prayer Jamie. God blesss u abundantly ohhhh. Chaiii, when i saw this prayer, i was like, you wrote this prayer for me. God bless you. I believe its my time to get my own spouse in JESUS’ name ohhh . Amen. Thanks lots. Thank you so much for the detailed sample prayer. I prayed it, I felt it and I believe God will bless me with the desire to be married. I am waiting on my husband while seeking God and his kingdom. God bless. I’ll keep you posted. Such an awesome prayer. Thank you. Be blessed! I thank God for what He is doing through you and I thank you for allowing God to live in and work through you! This prayer is just perfect because of how scripture – filled it is and it covers all the bases! I’m praying it every day! Thank you! Amen , thank you and God continue to bless you and to make you a blessing IJN. wonderful piece of prayer! it has come at a better time for me. be blessed. Wow! When I landed on your site and saw this prayer I cried, just what I have been praying for! Thank you for help with the perfect prayer to guide me pray for my future spouse and that God would heal, preserve and prepare us for each other even in our 50s?Thank you Abba Father for your faithfulness! Hi Jamie, this came at a right time for me. I have prayed for a godly wife for more than a decade but no avail. I thank God again that i found your article very interesting for praying for my rightful wife. I will be going to a Christian gathering this week and i have settle with my Father God that He’s going to give me a wife in the Lord. I strongly believe that it is done. I will share the testimony here by His grace. God is good. I Thank you from the bottom of my heart for the sample pray & I thank the lord for his promise to me & others on this site..may they all be blessed with what they seek….I feel I’ll be blessed with a husband soon….thanks again Amen.,.. Thank you for this prayer. The Holy Spirit directed me to this prayer because God knows this is exactly the prayer that I needed. My husband is on his way and any day soon he will walk into my life and I will realise why it never worked out with anyone else.Lord I thank you for my God ordained marriage. I am ready to say I DO!. To all of you who have commented here I want to challenge you for week to come daily to this site and choose a name of a person or persons and just call their names out to God and thank Him that …… (-whose ever name you choose) spouse is in route . I declare that divine encounters and before the month of July is many of us will have met the spouse we are praying and believing for. Receive your spouse today in Jesus name Amen. Please I really need a wife …so help me ABBA father in his holy name..Amen ??? This is a very helpful and thorough prayer and I so wish wholeheartedly that I’d prayed such a prayer before getting married. I got married last year at age 45 after spending 22 years single ( I broke off an unsuitable engagement aged 23) have been married almost a year to someone who I feel is a terrible fit for me and who it turns out is lukewarm in his walk with the Lord. We also have a very difficult situation regarding blending families and bitter ex etc. It is soooo important to pick the right person and really believe that God has the best for you. God bless you Jamie for this information and teaching. I hope that others can really use it and be blessed. I’m sorry that happened, AJ. But Father God can still work. He can heal your marriage and make it better than it ever was or ever could have been without His help. He is in the business of making all things new! Find a promise in the Bible for your healed, restored, awesome marriage, stand on it, and pray for your husband! You will see Father work! Thank you Jamie I will do that. I receive the blessing of this prayer in Jesus’ Name, AMENx4!!!! Thank you so much for this prayer!!!! God richly bless you. This is EXACTLY what I NEEDED TODAY! I have been experiencing hope deferred and I’ve gotten to the place where I don’t even want to talk about it anymore. This prayer was a blessing. Thank you! I got so tired of praying at some point. But this prayer brought back hope. Thank you very much as we wait on God. Thank you for a wonderful prayer. I believe my long delay marriage is settle and restore in Jesus Name. Very good prayer after this prayer I no God almighty has already hear my prayers AMEN God bless you. I love this post about finding a partner. This is exactly the prayer I need. Thanks for all the scriptures. I know will show up for me. I’m really bothered about not being married at this age. But with God, it’s never too late. I know He will make all things beautiful in it’s time. Thanks for the prayer. Father God, I thank You because You have already answered me. I love You Lord, I will trust you at all times. Regardless, i will pray these prayers — as if he ISN’T the right one, i don’t need to waste anymore time in something that’s going nowhere fast…he also wants to live together before marriage, “to make sure we’re compatible”! Thanks to all of you and blessings to each of you! Your site is a true blessing and will be coming back for more! Hey Kimmi. If he wants to fornicate before marriage, he is not the man God has for you–or else it’s not the right time if his heart isn’t right with God yet. God wants you to be holy. “Without holiness no man shall see the Lord.” If a man is leading you into sin, or you choose sin to be with him, then that relationship is not from the Lord. Even if our hearts are really in it–Papa God has something better for you. Hugs and prayers. I pray you would wait for God’s best. This prayer is heavenly. It’s almost as though you read my mind/heart while writing it. I have really been blessed and touched by it, and I believed it will come true in my life. Again, thank you so much , i am more than grateful, and may the Lord our heavenly father bless you in all his riches. The prayer has stilled my heart and wiped away my tears. I thank God for equipping you with the right words and pray for more grace and anointing upon your life in the mighty name of Jesus. THANK YOU SOO MUCH FOR THIS PRAYER. May God bless you for this prayer. I and my sisters have been believing God for a husband for a while. I was writing some prayer point for us before holy spirit led me to this site. I was amazed with the prayer.Instantly I know that God has answered my prayer before I even stated. am very sure that my husband and that of my sisters will show up any moment in Jesus name. May God bless you and household for giving me this prayer point. God bless you for leading me with such prayers. I have been asking God for a husband through prayers but after praying this ur strong words to God…..I’m so relieved. I thank you God for answering me even before I opened my mouth. Thank you holy spirit for leading me to this site. Shalom! I thank u God for this prayer. I believe I will meet my wife in earnest. My testimony is loading . Amen. Thank you lord in advance for my marriage. Thank you so much for this sample prayer. May the lord truly bless you in all that you do! Hi Jaime, I thought I was content being single, after all I’ve been praying for years and years and years for a husband and he hasn’t shown up yet. Till recently I had was in company with a friend who I took interest in. The attraction I have caused me to seek God again for a husband which in turn lead me til your page as I was searching a Christian, godly perspective on how to get our what to pray to get married. Long story short, your blog encouraged me that my desire to marry can treat happen. You prayed EVERYTHING I needed to go to God in prayer concerning His Will for my desire of wanting to marry, so I thank you for putting this online for ask of is seeking a spouse. Thank you thank you thank you!!! May God continue to bless you and your husband and your family. Thank you so much for the sample prayer. I have been helped. May the Dear Lord continue to bless you. I am looking forward to a Godly spouse in Jesus Christ’s name. Thank you for this. I am in my sixties now and have been single for the past 20 plus years. I dread being single for the rest of my life so I hope God will answer my prayer and send me the right spouse to share the rest of my life. I really blessed with this prayer,and know God is at work concerning my own case to give me divine Godly husband in Jesus Name. So greatfu, am overwelming now, hoping for my spouse to meeting together. Amen. Thank you for the wonderful prayer! I pray this year will be my year. I will write down this prayer in my dairy and pray with it every night before bed time… I pray that the Good Lord will grant those of us that are waiting our heart desires, this year will not pass us by in the mighty name of JESUS (amen). I will come back to this site and give my testimony. Thanks Jamie ,may the Good Lord strengthen you and your household in Jesus mighty name (amen). Amen Jamie. You’ve said it all, God bless you. My name is Daniel. I thank God for blessing me with a perfect spouse that I desire. All I want from God now is a financial breakthrough and a miracle marriage.. And I promise to serve him for the rest of my life.. I believe my blessing is so close. And my testimony is sure in Jesus name. Amen. Amen and Amen .finally my husband will be delivered to me.Thank you lord.I give you the glory.. Thank you so much for sharing this! I have been a widower for the past 5 years, and I so desire a new wife to share my life with. I am going to pray this prayer until God answers it! AMEN! I thank you for leading me through this prayer. May God answer me speedily together with your faith, Amen. thank you for the prayer. i really pray that God will answer my prayer and give me a loving husband. please remember me in your prayers. 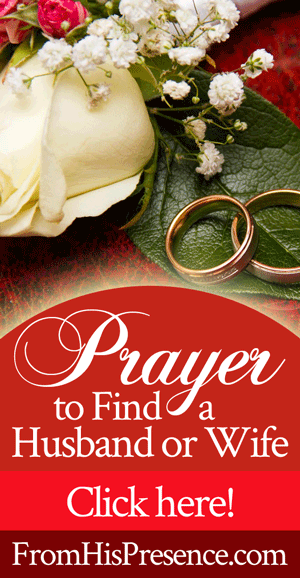 i have been praying for a husband for very many years and i am almost giving up. Most of my friends got married many years ago . I feel very depressed and sorry for myself . i do not know what to do. Hi CN, I feel the same way too. Everyday I wake up and wonder where my Husband is. May The good lord answer our prayers.